Only a few years ago, former Pixar animator Jimmy Hayward (Finding Nemo) directed the brilliant and clever Dr. Seuss adaptation, Horton Hears a Who, before getting sidetracked and sidewinded with his next film, the live-action Jonah Hex, based on the DC Comics Western. So Free Birds—which he co-wrote and directed—is his "Get Out of Movie Jail Free" card, I guess. Boasting as strong a cast of comedy adepts as Horton, Free Birds is also a cleanly rendered, lushly colored picture. The story is a muddle, however. With a free and clear field as far as Thanksgiving cartoons go, Hayward makes the mistake of getting overly complicated with what should have been a straightforward depiction of a uniquely American holiday, either as it exists today or at its inception. Instead, Free Birds fuses the two storylines, following the non-conforming turkey Reggie (Owen Wilson) as he's "pardoned" by the President of the United States, learns to love pizza as the First Daughter's beloved pet, gets kidnapped by the dim Jake (Woody Harrelson) who then sends them both hurtling "back in time to the first Thanksgiving, to get Turkeys off the menu!" There, Reggie meets Jenny (Amy Poehler), a fancy bird he cozies up to who finally makes him feel like he belongs. I don't even want to speculate how Free Birds will play overseas, with most countries blissfully unaware of the ins and outs of Thanksgiving. All I know is that Hayward gets a tad more convoluted than he needs to, abandoning two promising avenues for humor in favor of a single overstuffed, plot-based one. The idea of two turkeys trying to prevent a Pilgrim-driven bird-pocalypse is a clever one. 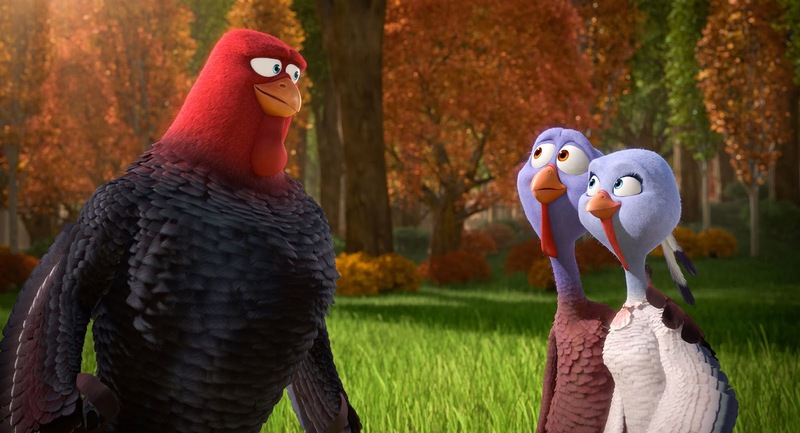 The one about a turkey outcast bonding with a politician's young daughter who's prone to narcolepsy is a bit more hilarious. Melding these two with an ill-conceived time travel device played by Star Trek's George Takei is an overreach that bogs the movie down in plot machinations. The last thing any of us need when trying to digest Free Birds is restless wee ones bored by its long, draggy stretches.